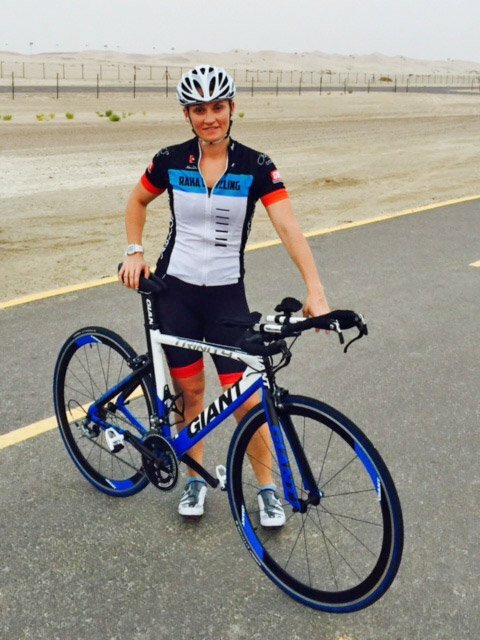 Lynsey Usher is a female personal trainer in Abu Dhabi, UAE who has a passion for cycling. Being a competitive cyclist, I wanted to share some tips and insight into why it is an excellent sport to partake in. Unlike running, cycling is extremely safe and kind to the joints making it an excellent choice for those battling with ongoing sports injuries or unable to take impact training. t is a fantastic sport to improve cardiovascular fitness, tone the legs and burn fat. Like anything, it is not necessary to spend huge amounts of cash on the latest technologically advanced carbon fibre bike when you are trying to test the water. 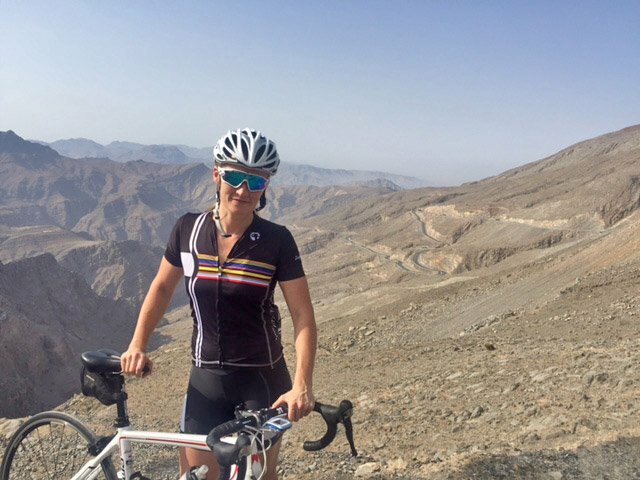 If you think cycling is for you, here are a few FAQ’s I come across from my Abu Dhabi personal training clients and friends alike. The Equipment – What Type Of Bike Should I Get? Before you purchase a bike, you need to consider your personal requirements from a bike. If you get the cycling bug, there is no such thing as one size fits all because different bikes bring different benefits. undoubtedly this is the right choice.Thin tyres have minimum road resistance and can be scary to ride on at first, but you will quickly become accustomed to this. It is not the most comfortably positioned bike so if you are not looking for speed, or to compete in cycle/triathlon events, do group riding you may want to consider the next option. HYBRID BIKE – A much more comfortable upright position bike. Perfect for commuting around and touring. Typically has straight handlebars. Hybrid bikes can cope with tarmac surface as well as dirt tracks as the tyres are slightly wider and more robust. MOUNTAIN BIKE – These types of bikes are the only choice for off road riding. Any mountainous, dune terrain requires a wide wheel. There is a new type of bike on the market called a “fat boy” which has exceptionally wide wheels and is hugely at home on the sand dunes. These can be rented from shops such as “Adventure HQ” if you want to try before you buy. Weight. Pure and simple. The lighter and better quality the components become the more expensive they are. Weight is of paramount importance to people who cycle at a high level. For beginners, it is pretty irrelevant. New Or Used – What Should I Invest In? In the UAE the second hand market of bikes it particularly buoyant. Many bikes half than their original price, when people move back to their home countries etc. The one positive about buying new is you ensure you get the correct frame size, expert advice and peace of mind with aftercare. If you do decide to go down the used route, take along a friend who is knowledgeable about cycling. Bike riding in the UAE is now becoming very popular and with purpose built cycle tracks as in Al Wathba, and cycling round the Yas F1 track 3 evenings per week, it has never been easier to ride safely. Winter riding is an absolute pleasure with near perfect conditions from October to April. 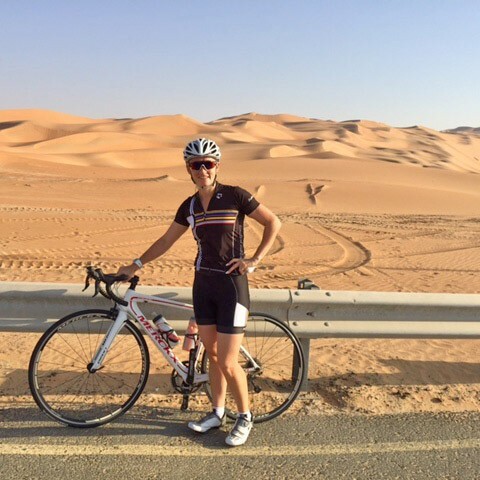 I would highly recommend cycling in the UAE to anyone………..